"We cannot afford to be in anyone's pocket or even in their corner. The free press must see itself as an important arbiter, committed to ideals and values that transcend interest groups of one kind or another." The free press relies on subscribers. Select a plan that's right for you. 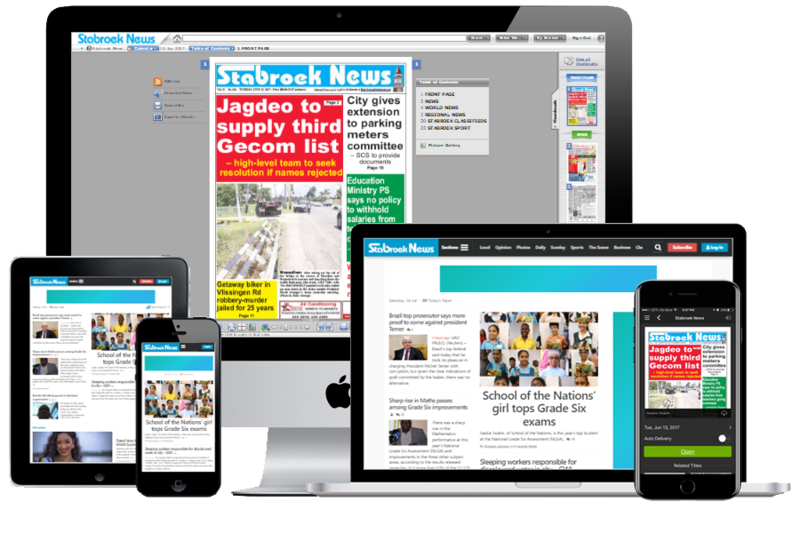 Unrestricted Access to stabroeknews.com from your computer, phone or tablet. Full access to the ePaper from your computer. Downloadable mobile apps for Android, iPhone and iPad that allow subscribers to listen to and read all stories. Subscribe for Access to the Entire Website for 1 Year. You will be automatically charged EVERY YEAR at the beginning of your subscription period. You may cancel at any time. Subscribe for Access to the Entire Website for 6 Months. You will be automatically charged EVERY 6 MONTHS at the beginning of your subscription period. You may cancel at any time. Subscribe for Access to the Entire Website for 3 Months. You will be automatically charged EVERY QUARTER at the beginning of your subscription period. You may cancel at any time. Subscribe for Access to the Entire Website for 30 Days. You will be automatically charged EVERY MONTH at the beginning of your subscription period. You may cancel at any time. Subscribe for Full Access to the Website. This is a one-time charge and your subscription will expire after 7 Days.